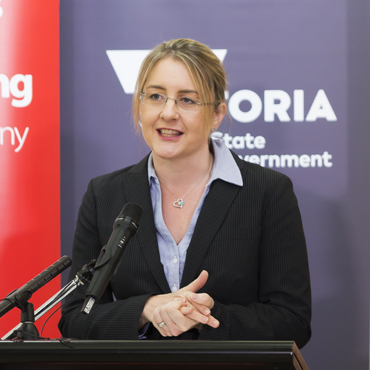 Employment Minister Jacinta Allan and Industry Minister Lily D’Ambrosio today welcomed Rinnai Australia’s announcement it will develop a major next generation manufacturing facility in Braeside in Melbourne’s south–east, creating 160 new jobs. The new manufacturing facility consolidates Rinnai Australia’s position in the Rinnai global network, helping to secure 185 existing jobs at Rinnai’s recently constructed Keysborough national head office, as well as 270 jobs at its wholly-owned subsidiary Brivis, which is located adjacent to the new Braeside manufacturing site. The 160 new jobs created at the new Braeside facility will include 89 new operational staff and 20 technical engineering staff in R&D in addition to management and administrative positions. The new facility will manufacture next generation hot water systems, and climate segment heating and cooling products for the Australian and international markets, targeting more than $50 million in incremental annual exports through existing Rinnai global distribution channels. Rinnai Australia anticipates that the new facility will be a driver of increased sales in Australia and reduced dependence on current levels of imports. The new manufacturing facility will be supported by an Australian R&D Centre linked to Rinnai Japan’s nearly 600 strong engineering R&D division in Nagoya, that will be able to access manufacturing and product development competencies from Rinnai Japan and enable Rinnai Australia to develop new innovative products for the Australian and export markets. Established in Melbourne in 1971, Rinnai Australia is a wholly owned subsidiary of Rinnai Japan, which is headquartered in Nagoya, the major industrial city of Victoria’s sister state, Aichi Prefecture. Rinnai Japan currently operates 17 international subsidiaries and manufactures in 13 countries, employing 8,100 people and earning consolidated annual revenues of US$3.4 billion.